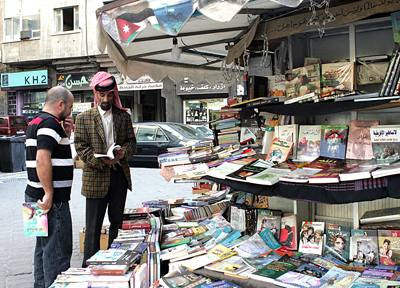 AMMAN - The kiosk at the end of Basman Street in the old downtown of Amman is more than just a place to buy books. The three generations of the Maaitah family that have owned and run Al Jahiz Bookshop for more than seven decades see the business in a completely different light. “Books are our sacred world. A solid bond has grown between books and our family throughout our history,” Hashem Maaitah, 40, told The Jordan Times. The bookshop is known as Khaznat (treasury of) Al Jahiz, after the legendary mediaeval Arab author who is said to have died after his huge bookshelf fell on him and has become an icon of Arab men of letters. According to Maaitah, it is the oldest bookshop in Jordan. “Our profession is not only selling books to the public as people think. In fact, our grandfather’s craft was warraq (the old Arabic name for a librarian, calligrapher and manuscript expert). We’ve been working in the book industry since 1931,” Maaitah said. According to Maaitah, his grandfather, Khalil Maaitah, started Al Jahiz in 1931 with a small case containing various books he brought from Jerusalem. In the holy city, he used to display his merchandise near Al Bouraq Wall in Al Haram Al Sharif, or the Noble Sanctuary. He imported the books from different Arab countries, the grandson said. The grandfather joined the army but kept his bookshop, and returned again to Jerusalem as a soldier defending the city in the 1948 Arab-Israeli war. He was killed in the line of duty and his son, Hashem’s father Mamdouh, took over the tradition of the family. Mamdouh Maaitah also volunteered in the fight against the occupation. During skirmishes with the Israeli forces near the holy city in the 1950s, he suffered a leg wound, the son said, after which His Majesty the late King Hussein ordered that the injured soldier be admitted to the American Hospital in Beirut. Maaitah told The Jordan Times that his father’s visit to Beirut was beneficial and valuable as it gave him a clearer insight into the book industry. “When my father was in the hospital, he met a nurse named Hala. He wrote her a poem in recognition of her help and in praise of her beauty. She helped him with contacts to buy books from Lebanon,” he said. The bookseller added that in 1957, when all the British officers were replaced with Jordanians upon orders by the late King, his father bought the entire stock of the English library in Jerusalem. Their passion for books has motivated the family to think about novel ways to encourage people to read books. Mamdouh bought out four bookshops in different locations in Jordan in 1978, and developed a system for people to borrow books. Maaitah pointed out that the shop has faced many problems with the municipal authorities in Amman, which forced the family to change the location of the bookshop several times. The reputation of Al Jahiz as a place to find rare books and manuscripts has spread to unexpected places, claimed the owner, saying that the shop has counted students from such places as the Sorbonne and Oxford University among its customers. “We had various rare books such as an 1850 version of the Bible, the 1947 translation of the Greek epic The Odyssey, copies of textbooks taught at schools in the Ottoman era and a rare Arabic-Turkish dictionary,” Maaitah said. The shop also displays literary curios, such as various bottles of German ink dating back to Ottoman era, which Maaitah said have helped to turn the kiosk into museum, as many people come to see them. Maaitah and his brothers run the kiosk 24/7, and still allow people to borrow books for a fee. “The customer pays JD5 to borrow a book and when he or she brings it back, we pay back JD4,” Maaitah explained. Haider Mahmoud, a renowned poet and former minister of culture, told The Jordan Times that Al Jahiz is not only a valuable bookshop, but also a “magnificent museum due to its richness in rare books”. “Technology and the Internet have affected the relationship between people and books, but members of this family try their best to maintain this relationship,” Mahmoud added. Asha Sharif, a British citizen currently working in Jordan, has also joined the fan club. “I haven’t seen such a bookshop. It’s full of books: old books and modern ones. The good thing is they sell English novels and various dictionaries which are really useful,” Sharif said. But Ibrahim Sawaeer, a columnist at Al Rai daily, said he is not happy with the new location and look of the bookstore. Nonetheless, for the Maaitah family, it is not their shop’s appearance that makes it special, but rather the spirit that has flowed through it from generation to generation of book lovers and advocates.